How to make an isotonic sports drink ? 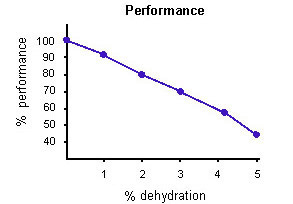 Hydration is crucial in any endurance sport, both at professional and amateur level. Bad hydration inevitably leads to poor performance and can cause tendinitis and other health problems. 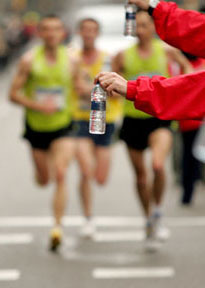 The endurance athlete must drink on a regular basis before, during and after exercise. Drinking pure water is not recommended. The endurance drink must be isotonic. Explanations, tips and recipes to make an economic drink equivalent to commercial ones. Sports drinks aim at keeping your body hydrated, replacing fluid and electrolytes (salts) lost through sweat, and providing energy from carbohydrates. Do not drink pure water ! Your drink should be isotonic, i.e. of osmolarity as close as possible as that of the human body. In Layman’s terms, the density of the drink must be close to that of blood plasma in order to facilitate its absorption by the blood. A drink too dense will require the body to secrete water to absorb it (dilution effect). The effect will be opposite to the one desired and can even lead to dehydration ! A drink too sparse or simply plain water may paradoxically lead to the same situation. To prepare an isotonic drink, you need water, tea or fruit juice (for flavour), sugar (sucrose or fructose) and, for long duration efforts, maltodextrin (where to buy maltodextrines ?). Make sure you follow the right proportions. Maltodextrin is a carbohydrate derived from corn, an association of several molecules of glucose and maltose. It is obtained by partial hydrolysis of corn starch (sometimes wheat). Hydrolysis, i.e. decomposition by water, produces molecules of smaller size. The hydrolysis of sucrose, for example, gives glucose and fructose. Depending on the degree of hydrolysis (dextrose equivalent), it will result in pure glucose (dextrose), syrups, maltose or maltodextrins. Maltodextrins do not taste sweet and are digested more rapidly than starch. Unlike most fast sugars, fructose in particular, they are well tolerated by the body. The degradation of glucose is a slow process, hence the interest to use it in combination with fast sugars in long workout beverages. Consider 30 g / l (warm weather) to 70 g / l (cold weather) sugar (sucrose) for an isotonic drink. You can use sugar cubes or powder. Dissolve the sugar in a cup of green tea, lemon tea or vanilla tea. Add a pinch of salt. Complete with water and cool down in a refrigerator. The drink should be consumed within 24 hours. You can also replace sugar and tea by 50 cl of fruit juice and complete with water. For the pre-workout drink, reduce the amount of sugar and replace sucrose by fructose. Fructose is a simple sugar that can be found in fruit and honey. Being assimilated by the body more slowly than glucose or sucrose, it reduces the secretion of insulin and the risk of hypoglycemia. A disadvantage of fructose, apart from its higher cost than sucrose, is that it is sometimes poorly tolerated by the body. It can cause diarrhea or nausea. For long efforts, drinks made of simple sugars are insufficient if not complemented by solid food and / or by maltodextrins. The use of maltodextrins in complement of simple sugars (sucrose, fructose) represents additional power which will be available approximately 2 hours after absorption. These glucose polymers, similar to carbohydrates although they are actually not, take some time to break down into glucose. To prepare a long effort drink, pour 30 to 40 g of maltodextrin in 1 liter of water or tea. Add 30 g (warm weather) to 70 g (cold weather) sugar (sucrose) or syrup. Add a pinch of salt. You can also replace sugar with 50 cl of fruit juice and complete with water. Cool down and drink within 24 hours. Drink before feeling thirsty, absorbing small sips on a regular basis. The sensation of thirst indicates a significant loss of water which will be difficult to recover. Do not ingest too large quantities at a time as this would slow down the stomach activity which is limited to approximately 750 ml per hour. Also note that every one percent of body weight lost in water implies a decrease of 10% of the physical abilities ! It is therefore essential to hydrate properly before, during and after the effort. Where to buy maltodextrins ? You will find maltodextrins in specialized shops or on the Internet (see links below). They are sold in packs of 1 to 4 kilos. These sugars are fairly expensive but offer substantial savings. A box of 4 kg (8.8 lb) allows to prepare 100 to 130 liters of drink (i.e. 200 to 250 hours cycling or 50 long rides) for a price of about 4 to 5 times lower than the drinks available in the market. Endurance athletes regularly push their bodies to the limits with a strenuous training regimen that demands smart nutrition. In Sports Nutrition for Endurance Athletes, Ryan offers proven strategies for improved athletic performance with sport-specific guidelines for running, cycling, triathlon, swimming, adventure racing, and rowing. In-depth information is presented in an easy-to-read and accessible style, with individual chapters dedicated to each of these popular endurance sports. Find your endurance advantage in the foods you eat. Endurance Sports Nutrition will help you select the best foods, fluids, and supplements to train longer, recover more quickly, avoid injuries, and achieve your performance goals in any endurance endeavor.